Kennon Road - Free fall down to a seemingly bottomless valley depth in contrast to the heights you see when you gaze upon majestic rock mountains where everything leaves you breathless and you wonder in awe and amazement by whose power did all these tapestry come from? It seems surreal that you can not possibly just believe that all of it was just pasted together out of nothing nor can you simply be so wise to conclude that it was all but science. One thing I am sure about is that these mountains and valleys are beyond what man's limited comprehension can ever grasp as with all that nature offers: seas and forests and what not. 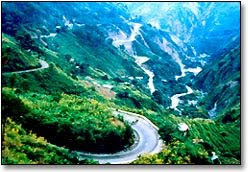 So much for the words and nonsense, I was just thinking of the scenery from both sides of the road when you pass by Kennon road climbing up towards Baguio city. There is this sense of mystery that enshrouds the place that it feels eerie at times. Is it because of the ghosts stories from the city itself which dates back before the major earthquake of the early '90's,? Or the ancient practices of minor tribes from the higher part of the uplands,? Or am I just trying to explain why it is mesmerizing and nearly hypnotizing to simply stare at these hills? Whatever the case is, there is a sense of belongingness that I feel, be it only a mere feeling or so. I imagine myself as if I was the heroine in one of those Chinese flicks, free falling to a bottomless valley where there is no sense of time nor space, only freedom from all the cares and worries of a life so full of turmoil in both mind and spirit.